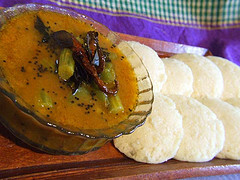 South Indian Sambhar is a standard menu and can be seen in hotels and homes of any part of South India. 1. Wash Tur dal and cook it in 3 cups of water, preferably in a pressure cooker, and switch off the cooker. 2. Wash the vegetables and cut them into long pieces. Wash them once again. 3. Add the above masala powders (Item 3) to the vegetables. Cook the vegetables in another vessel. 4. Add the well-cooked dal into the cooked vegetables. If the dal is not tender, blend it well. Cook altogether for 5-7 minutes. Add tamarind pulp, and boil for 3-5 minutes. Add little more water if needed, to get the required consistency. 5. Heat a frying pan on the stove, and add the cooking oil. When the oil is heated add mustard seeds. Allow mustard seeds to splutter. Then add fenugreek, red chillies (splitted into two), curry leaves, and remove from the fire. Add asafoetida powder to the oil, and also the remaining coriander powder. Mix it well in that oil and add it to the cooked sambhar. A nice fragrance will come. Add coriander leaves on the top and cover it up for 3 minutes. 1. Instead of tamarind pulp, you can use tamarind juice in South Indian cuisine. 2. While adding asafoetida powder and coriander powder into the seasoning, care should be taken not to get burnt. Immediately after 30 seconds of adding it, the entire seasoning ingredients to be sprinkled over the cooked sambar. 3. Instead of the above mentioned vegetables, you can use any 3-4 types of vegetables of your choice such as ashgourd, bottlegourd, yam, raw banana, noolkhol, capsicum etc. 4. Ready made sambhar powders are available in many Indian stores.